I'm using the squares under flower arrangements for a Hawaiian themed bridal shower. Correct size, good fringe, OK price. It compliments the theme for my daughters baby shower. Going to place wedding center pieces on these. Using this to put centerpieces on. Are all 4 sides fringed? Just the right touch for fall decorating!!! 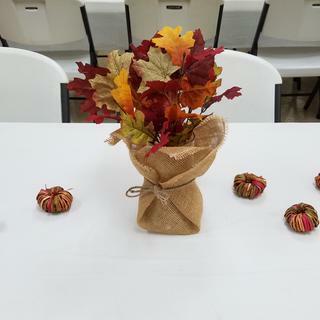 I used the burlap squares and jute twine to wrap 8 cylinder vases of fall leaves (along with scattered rattan pumpkins), which were used as table centerpieces for a Reformation Celebration at my chuch. Everyone loved the festive fall decorations! Just the right touch for fall decorating!